LORD Glitters is still on course for the QIPCO Queen Elizabeth II Stakes at Ascot on Champions Day. That’s despite a below-par run in the Woodbine Mile at Canada last month. David O’Meara’s grey was a leading fancy for the Grade One pot but got played up before the start and never got into the race, finishing sixth of the eight runners. Before his trip to Canada, Lord Glitters had won the Group 3 Sky Bet And Symphony Group Strensall Stakes at York plus been placed in two Group One QIPCO British Champions Series races – the Queen Anne Stakes and Qatar Sussex Stakes. 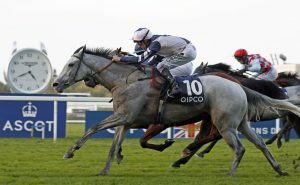 Meanwhile, this year’s £250,000 Balmoral Handicap, sponsored by QIPCO, the race that brings down the curtain on QIPCO British Champions Day at Ascot on October 20, has attracted a bumper 74 entries. A maximum field of 20 will be allowed to run in the mile contest, which is Europe’s richest mile handicap. Last year all bar three of the runners had an official rating of at least 100. O’Meara, trainer of the 2018 winner Lord Glitters, is hopeful of having multiple runners in his quest to hit the jackpot for the second successive year. He has indicated that all five of his entries – Escobar, Waarif, Firmament, Markazi and Bravery – could run if they make the cut. The present ratings of Waarif, who has been prolific this year, Firmament, eighth and third in the past two runnings of the Balmoral Handicap, and Escobar, give them solid prospects of featuring in the final field. “There’s huge money on offer and I’d hope to have as many runners as possible,” O’Meara said. “Waarif’s won four times this year, including at Ayr the other day and that will help get him into the race. He’s been very tough this year and I suppose he’s taken us by surprise. How much more he’s got in him is anybody’s guess. He seems versatile regards the ground but, if anything, he seemed to enjoy that heavy ground at Ayr. Lord Glitters was having only his second start for O’Meara when winning the Balmoral Handicap last year, having formerly been trained in France. Markazi has a similar profile, having won six of his 16 starts for Jean-Claude Rouget in France before finishing a staying-on fourth in a Haydock handicap on his British debut on 11th August. Numerically, nobody has more entries than Mark Johnston, who has eight engaged. His squad includes Poet’s Society, the horse who provided his with his record-breaking 4,194th winner in Britain when scoring at York last month. Remarkably, John Gosden has saddled the Balmoral Handicap runner-up in each of the past four years. His quartet of entries this time consists of Laugh Aloud, a runaway Group 3 winner at Epsom last summer; Tricorn, third in the Britannia at Royal Ascot in 2017 and an eye-catching second at Chelmsford last time; plus two progressive three-year-olds in the shape of Stylehunter, an easy winner at Goodwood last time after finishing sixth in the Britannia, and Argentello, who has won three of his past four races.